Publicity for March of Dimes. 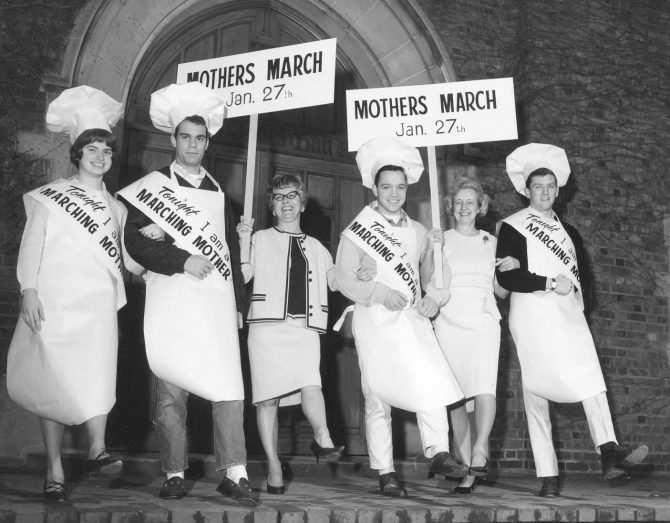 Stepping off with their best foot forward are volunteers for the January, 1966, Mothers March (of Dimes.) Posed on the steps of Jones Hall located on the University of Puget Sound campus are four UPS students who are helping the campaign: Gay Brazas, Blake Barfuss, Steve Kneeshaw and John Gruen. They are accompanied by Mrs. Robert Hash and Mrs. Robert Strobel carrying signs marking January 27th as the date of the Mothers March. Mrs.